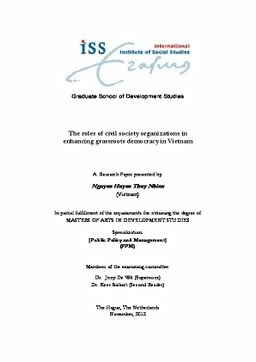 Following the discourse on democracy, participation and their links to civil society, this paper aims to assess the roles of civil society organizations in enhancing grassroots democracy in Vietnam. By contesting different theories in the context of single-one Party and government, the research shows that the case of grassroots democracy and civil society in Vietnam are special and far from recent dominant views on democracy and civil society. The study argues that grassroots democracy regulations adopted by the government is inherently participation rather than liberal democracy which is prominent trend nowadays. It also finds that civil society in Vietnam is still under state’s control and monitoring, differing from traditional perception that civil society is autonomous. Within the local democratic sphere of grassroots democracy regulations, civil society organizations in which Mass organizations and Vietnamese Non-governmental organizations are found distinct in relation to state and interventions have showed their roles in dissemination, capacity building, advocacy, facilitation to support people in realizing their participation rights to public affairs at local level. Their roles are constrained within the “narrow” environment with strong supervision from single-Party state and lack of supporting mechanism to their interventions. But more importantly, the research points out that the institution, including local government and people’s attitude and capacity, local level political dynamics and mindsets to understand and embrace local participation, is the pivotal conditions to ensure effective grassroots democracy implementation. Therefore, the research concludes that the roles of civil society organizations in enhancing grassroots democracy will be sustained and have wider impact if they always bear in mind this transformative and structural change.